One of the things on the internet that often sends me into a minor rage (because, you know, there are just so few offensive things out there that I had to find something, anything to be annoyed at) is misuse of statistics. It is so easy for a manipulative writer to "deceive the masses" with numbers (myself often included), and then there are those who unintentionally misuse statistics in their articles and go about their merry days guilt free. That is among the reasons I wrote a post a while back about the benefits and limits of statistics. The point was really to encourage readers to think critically. Interestingly enough, that is my most popular post ever, so maybe I am onto something! I seem to encounter statistically infuriating writing in the news or other websites on a near weekly basis, often written by "experts." Yikes! But this week, I found something statistically hilarious on buzzfeed.com: "The 10 Most Bizarre Correlations." Ok, I know I have a dorky sense of humor. But come on people, these are funny! For those still scratching their heads about why this is absurd, notice that the two graphs are presented in total counts (total sales and total diagnoses), not as proportions of the total population represented by the graph. My best guess is that the population growth curve would match up very closely to these two metrics or that the population growth curve plus other factors would do so, but without that information specifically provided, we cannot know. It really doesn't mean that much statistically to say that there were four times as many disease diagnoses counted in 2008 compared to 1998 if there were also four times as many people alive in general (or if the methods for diagnoses became better, such that the disease was simply identified with greater ease). If that were the case, the rate of disease may have stayed constant. 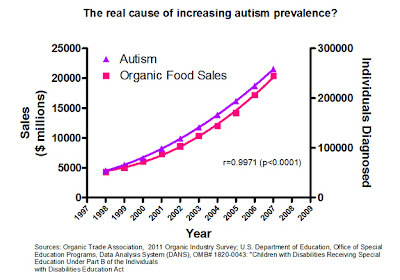 The same is true with the purchase or organic produce - it could be an increase based solely on having a larger population (or another possibility is that the number of organic produce purchases remained constant, with the price of the organic produce quadrupling, thus increasing total dollar sales). With this graph, we really have no way of knowing what this data really means, as it has no reference to how many people were in the population each year, nor do we have information on many other associated metrics. 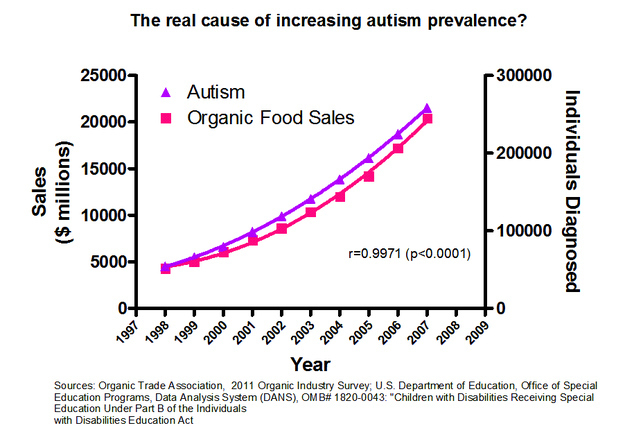 Without asking critical thinking questions, some might look at this and automatically conclude that there is a link between organic food and autism. Gotta love the misuse of science! I'll stick with my pesticide fruit, thank you very much! As the comic author writes in the sub-text (when you hold your mouse cursor for a couple of seconds over the comic on their website), "There are also a lot of global versions of this map showing traffic to English-language websites which are indistinguishable from maps of the location of internet users who are native English speakers." Yes! 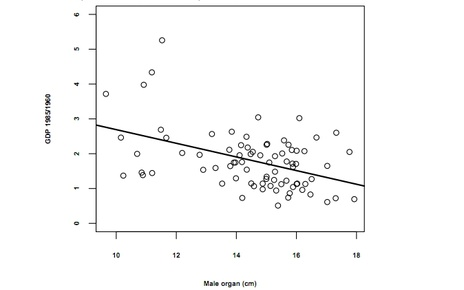 Another one of my favorites from the buzzfeed article is a 1960's study demonstrating that countries with slower growing economies have men with longer "male organs." I knew there was a silver lining to the recession! Ok, but seriously now - can you think of other factors that might create this effect, beyond the economic growth of a country? This is a test of your analytic prowess! To see the rest of the odd examples of correlation, check out this awesome article: http://www.buzzfeed.com/kjh2110/the-10-most-bizarre-correlations. My prayer team is rapidly growing, and I am so thankful for everyone who is willing to support me in this way! Prayer is the most important thing I need going into this trip! With regards to fundraising, the latest figure I have received from our trip coordinator is $425 raised out of a total of $1900 needed. If you are interested in joining my prayer team, please call/email me directly or message me below. For financial donations, please make checks payable to Living Water International and mail with the remittance slip at this link to make sure it gets attributed to my trip! You can also make donations via credit card by calling our Living Water trip coordinator, Sarah Evans, at (281) 207-7814. The organization will give me the names of all who donate, so that I can thank you! Don't forget to include the remittance slip in the envelope. Thanks again to all who have already joined my team, either financially or in prayer. Your support means so much!